"This is no longer hosted on GGZ which shocked me and sent me on a hunt for the download. You can download this here. This was made by someone who REALLY loves japan. Hard to explain the game in its entirety. One thing I remembered was the currency system, there is no “gold” but rather you trade items to get other items. Also an interesting character select system and a story that goes in several different places. Some would say this is less of a classic and more of some anomaly as far as amateur RPGs go. To me it was what got me into RPG Maker and SNES emulation heavily as the Bahamut Lagoon rips had me mesmerized." 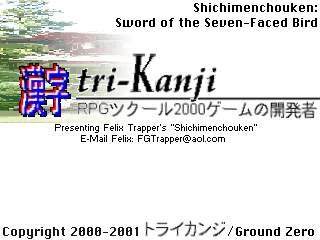 Shichimenchouken is an RPG made using RPG Maker 2000. It is set in a setting inspired by feudal Japan. Players control Kojitsuke who in attempting to steal medicine to heal his sickly father, is caught and is forced to go on a quest to acquire the ingredients himself. With the aid of numerous allies Kojituske explores the land with the help of numerous allies. Eventually though he discovers that there is something more sinister at work in the land that must be fought. Shichimenchouken among other things is styled as a SNES styled RPG from Japan mixing traditional storytelling with comedy and drama. It also features a unique buying/selling system that utilizes bartering.